Build and customize a 3D wood model of Thor’s hammer and read all about Marvel’s Thor, Thor: The Dark World, Avengers, and Avengers: Age of Ultron with this deluxe model set. 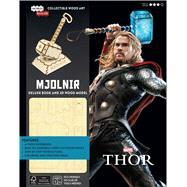 A legendary warrior of Asgard, Thor wields one of the greatest weapons ever made, the enchanted hammer Mjolnir. Complete with a hardcover book that covers Thor’s role in the Marvel Cinematic Universe, this deluxe IncrediBuilds book and model set showcases a 3D model of the epic hammer that is perfect for customizing and displaying. Joshua Sky has served as a writer and copywriter for Marvel Entertainment, Hasbro, NTD Apparel, WeLoveFine, REA, Javen Design, and Young Jewish Professionals. He has written articles for HEEB Magazine, the Gaggle, and co-wrote the produced game show pilot Geek Vs. Geek. Further, he is a contributing joke writer for the Marvel comedy web-series, Marvel Heroes What The?! and has served as a script reader for the Hamptons International Film Festival.